Definition at line 30 of file RockSwapDir.h. Definition at line 34 of file RockSwapDir.h. Definition at line 33 of file RockSwapDir.h. Definition at line 42 of file RockSwapDir.cc. Definition at line 48 of file RockSwapDir.cc. References filePath, io, map, and safe_free. Definition at line 395 of file RockSwapDir.cc. Definition at line 112 of file RockSwapDir.cc. References StoreEntry::attachToDisk(), Ipc::StoreMapAnchor::complete(), EBIT_SET, ENTRY_VALIDATED, Ipc::StoreMapAnchor::exportInto(), StoreEntry::flags, Store::Disk::index, PING_NONE, StoreEntry::ping_status, STORE_OK, STORE_PENDING, StoreEntry::store_status, SWAPOUT_DONE, and SWAPOUT_WRITING. Referenced by anchorToCache(), and get(). Definition at line 76 of file RockSwapDir.cc. References anchorEntry(), DiskFile::canRead(), hash_link::key, map, Ipc::StoreMap::openForReading(), theFile, and updateAnchoredWith(). Reimplemented in Fs::Ufs::UFSSwapDir, TestStore, Store::Disks, and Store::Controller. Definition at line 72 of file Storage.h. Definition at line 597 of file RockSwapDir.cc. References DiskFile::canWrite(), debugs, HERE(), io, Ipc::Mem::PageId::ioPage, DiskIOStrategy::load(), map, needsDiskStrand(), Ipc::Mem::PageLevel(), Ipc::Mem::PageLimit(), DiskIOStrategy::shedLoad(), and theFile. Definition at line 837 of file RockSwapDir.cc. Definition at line 215 of file Disk.cc. Definition at line 213 of file RockSwapDir.cc. References assert, createError(), DBG_IMPORTANT, debugs, filePath, HeaderSize, HERE(), IamDiskProcess(), Store::Disk::maxSize(), Must, O_BINARY, Store::Disk::path, Store::Disk::stat(), and UsingSmp(). Definition at line 273 of file RockSwapDir.cc. References DBG_CRITICAL, debugs, fatal(), filePath, and xstrerr(). Definition at line 626 of file RockSwapDir.cc. References assert, debugs, diskOffset(), DiskFile::error(), HERE(), Store::Disk::index, IoState, hash_link::key, map, NULL, Ipc::StoreMap::openForWriting(), Ipc::StoreMapAnchor::set(), theFile, and trackReferences(). Definition at line 666 of file RockSwapDir.cc. References Ipc::StoreMapUpdate::Edition::anchor, assert, debugs, diskOffset(), Ipc::StoreMapUpdate::entry, DiskFile::error(), Ipc::StoreMapUpdate::Edition::fileNo, Ipc::StoreMapUpdate::fresh, HeaderSize, Store::Disk::index, IoState, Must, slotSize, and theFile. Definition at line 161 of file RockSwapDir.cc. Definition at line 152 of file RockSwapDir.cc. References freeSlots, Store::Disk::maxSize(), Ipc::Mem::PageStack::size(), and slotSize. Definition at line 1008 of file RockSwapDir.cc. Definition at line 126 of file RockSwapDir.cc. References Ipc::StoreMap::abortWriting(), assert, Ipc::StoreMap::closeForReading(), StoreEntry::detachFromDisk(), StoreEntry::hasDisk(), ignoreReferences(), Store::Disk::index, map, StoreEntry::mem_obj, NULL, Store::Root(), MemObject::SwapOut::sio, Store::Controller::stopSharing(), StoreEntry::swap_filen, and MemObject::swapout. Referenced by evictCached(), and finalizeSwapoutFailure(). Definition at line 983 of file RockSwapDir.cc. References DBG_IMPORTANT, debugs, and filePath. Definition at line 700 of file RockSwapDir.cc. Referenced by createStoreIO(), createUpdateIO(), diskOffsetLimit(), and entryLimitAbsolute(). Definition at line 707 of file RockSwapDir.cc. References assert, diskOffset(), map, and Ipc::StoreMap::sliceLimit(). In SMP mode only the disker process reports stats to avoid counting the same stats by multiple processes. Definition at line 169 of file RockSwapDir.cc. Definition at line 46 of file Disk.cc. Definition at line 941 of file RockSwapDir.cc. References assert, debugs, map, Ipc::StoreMapSlice::next, Rock::WriteRequest::sidCurrent, Rock::WriteRequest::sio, and Ipc::StoreMap::writeableSlice(). Definition at line 43 of file Disk.cc. Referenced by Store::Disk::disconnect(), and Fs::Ufs::UFSSwapDir::dump(). Definition at line 493 of file RockSwapDir.cc. References fileConfig, DiskFile::Config::ioRate, and storeAppendPrintf(). Definition at line 541 of file RockSwapDir.cc. References PRId64, slotSize, and storeAppendPrintf(). Definition at line 442 of file RockSwapDir.cc. References fileConfig, DiskFile::Config::ioTimeout, PRId64, and storeAppendPrintf(). Definition at line 60 of file RockSwapDir.h. References diskOffset(), entryLimitActual(), noteFreeMapSlice(), purgeSome(), reserveSlotForWriting(), slotLimitAbsolute(), slotLimitActual(), SwapFilenMax, validSlotId(), and writeError(). Referenced by entryLimitActual(), and validateOptions(). Definition at line 206 of file RockSwapDir.cc. References entryLimitAbsolute(), min(), and slotLimitActual(). Referenced by entryLimitAbsolute(), Rock::Rebuild::Rebuild(), and statfs(). Definition at line 1033 of file RockSwapDir.cc. 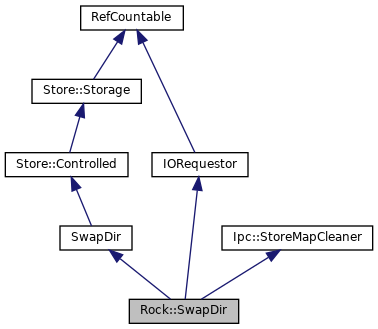 References CollapsedForwarding::Broadcast(), debugs, disconnect(), evictIfFound(), Ipc::StoreMap::freeEntry(), StoreEntry::hasDisk(), Store::Disk::index, StoreEntry::locked(), map, StoreEntry::publicKey(), and StoreEntry::swap_filen. Definition at line 1026 of file RockSwapDir.cc. Definition at line 181 of file RockSwapDir.cc. Definition at line 175 of file RockSwapDir.cc. Definition at line 1117 of file RockSwapDir.cc. References String::append(), Store::Disk::path, and String::termedBuf(). 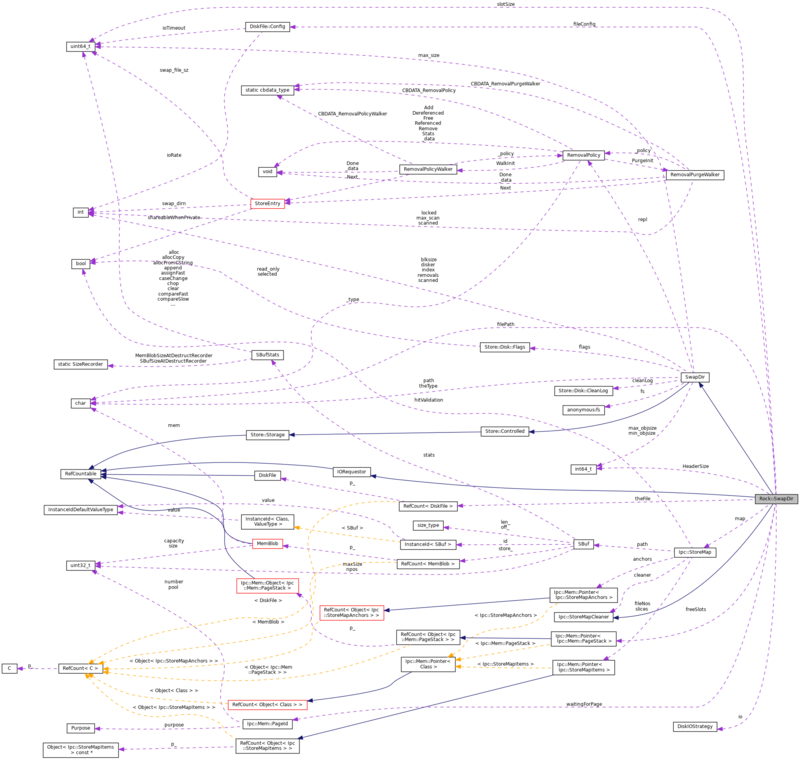 Referenced by init(), and smpAware(). Definition at line 975 of file RockSwapDir.cc. References freeSlots, NULL, and Ipc::Mem::PageStack::size(). Definition at line 57 of file RockSwapDir.cc. References anchorEntry(), DiskFile::canRead(), StoreEntry::createMemObject(), map, NULL, Ipc::StoreMap::openForReading(), theFile, and trackReferences(). Definition at line 376 of file RockSwapDir.cc. References dumpRateOption(), dumpSizeOption(), dumpTimeOption(), Store::Disk::getOptionTree(), ConfigOptionVector::options, parseRateOption(), parseSizeOption(), parseTimeOption(), and vector. Definition at line 914 of file RockSwapDir.cc. References noteFreeMapSlice(), Rock::WriteRequest::sidNext, Rock::WriteRequest::sio, and writeError(). Definition at line 885 of file RockSwapDir.cc. References assert, DISK_OK, Rock::WriteRequest::eof, WriteRequest::len, map, Ipc::StoreMapSlice::next, NULL, Rock::WriteRequest::sidCurrent, Rock::WriteRequest::sidNext, Rock::WriteRequest::sio, Ipc::StoreMapSlice::size, Ipc::StoreMap::switchWritingToReading(), and Ipc::StoreMap::writeableSlice(). Definition at line 1126 of file RockSwapDir.cc. References Ipc::StoreMap::hasReadableEntry(), hash_link::key, map, and Rock::RunnerRegistrationEntry(). Definition at line 1055 of file RockSwapDir.cc. References debugs, HERE(), RemovalPolicy::Remove, Store::Disk::repl, and StoreEntry::repl. Definition at line 282 of file RockSwapDir.cc. References Ipc::StoreMap::cleaner, DiskFile::configure(), DBG_CRITICAL, debugs, fatal(), fileConfig, filePath, DiskIOModule::Find(), freeSlots, freeSlotsPath(), HERE(), DiskIOStrategy::init(), inodeMapPath(), io, map, Must, needsDiskStrand(), DiskIOStrategy::newFile(), DiskFile::open(), shm_old, Store::Controller::store_dirs_rebuilding, and theFile. Definition at line 1111 of file RockSwapDir.cc. Definition at line 817 of file RockSwapDir.cc. References debugs, Ipc::StoreMap::entryLimit(), DiskFile::error(), fatalf(), filePath, Store::Disk::index, map, Store::Disk::maxSize(), rebuild(), Ipc::StoreMap::sliceLimit(), theFile, and xstrerr(). Definition at line 227 of file Disk.cc. Definition at line 991 of file RockSwapDir.cc. Referenced by Store::Disk::maxSize(), Store::Disk::objectSizeIsAcceptable(), storeDirSelectSwapDirLeastLoad(), validateOptions(), and Fs::Ufs::UFSStoreState::write(). Referenced by Store::Disk::canStore(), create(), currentSize(), Store::Disk::diskFull(), Fs::Ufs::UFSSwapDir::dump(), Store::Disk::getStats(), ioCompletedNotification(), Fs::Ufs::UFSSwapDir::maintain(), Store::Disk::maxObjectSize(), Store::Disks::maxSize(), Store::Disk::minSize(), slotLimitActual(), Fs::Ufs::UFSSwapDir::statfs(), statfs(), storeDirSelectSwapDirLeastLoad(), and validateOptions(). Referenced by Fs::Ufs::UFSSwapDir::maintain(), Store::Disk::maxSize(), and Store::Disks::minSize(). Definition at line 318 of file RockSwapDir.cc. References Config, DiskIOModule::Find(), InDaemonMode(), and SquidConfig::workers. Referenced by canStore(), init(), and openStoreIO(). Definition at line 754 of file RockSwapDir.cc. References freeSlots, Store::Disk::index, NULL, Ipc::Mem::PageId::number, Ipc::Mem::PageId::pool, Ipc::Mem::PageStack::push(), and waitingForPage. Referenced by entryLimitAbsolute(), handleWriteCompletionProblem(), and writeCompleted(). Definition at line 212 of file Disk.cc. Definition at line 769 of file RockSwapDir.cc. References assert, Ipc::StoreMapAnchor::basics, debugs, DiskFile::error(), StoreEntry::hasDisk(), HERE(), Store::Disk::index, Ipc::Mem::PageId::ioPage, IoState, hash_link::key, map, needsDiskStrand(), NULL, Ipc::Mem::PageLevel(), Ipc::Mem::PageLimit(), Ipc::StoreMap::peekAtReader(), Ipc::StoreMapAnchor::sameKey(), Ipc::StoreMapAnchor::Basics::swap_file_sz, StoreEntry::swap_file_sz, StoreEntry::swap_filen, and theFile. Definition at line 327 of file RockSwapDir.cc. References String::append(), assert, filePath, Store::Disk::index, Store::Disk::parseOptions(), parseSize(), Store::Disk::path, Store::Disk::repl, String::termedBuf(), validateOptions(), and xstrdup. Referenced by Store::Disk::disconnect(), parse(), and reconfigure(). Definition at line 451 of file RockSwapDir.cc. References DBG_CRITICAL, DBG_IMPORTANT, debugs, fileConfig, DiskFile::Config::ioRate, NULL, Store::Disk::path, self_destruct(), and strtoll(). Definition at line 359 of file RockSwapDir.cc. References DBG_IMPORTANT, debugs, fatal(), GetInteger(), i, Store::Disk::max_size, and Store::Disk::path. Referenced by parse(), and reconfigure(). Definition at line 501 of file RockSwapDir.cc. References DBG_CRITICAL, DBG_IMPORTANT, debugs, NULL, Store::Disk::path, self_destruct(), slotSize, and strtoll(). Definition at line 403 of file RockSwapDir.cc. References DBG_CRITICAL, DBG_IMPORTANT, debugs, fileConfig, DiskFile::Config::ioTimeout, NULL, Store::Disk::path, self_destruct(), and strtoll(). Referenced by MmappedFile::read(), IpcIoFile::readCompleted(), BlockingFile::readDone(), DiskdFile::readDone(), and DiskThreadsDiskFile::readDone(). Definition at line 843 of file RockSwapDir.cc. References assert, ReadRequest::buf, DISK_OK, RefCount< C >::getRaw(), request(), and Rock::ReadRequest::sio. Definition at line 590 of file RockSwapDir.cc. Definition at line 349 of file RockSwapDir.cc. References Store::Disk::parseOptions(), parseSize(), and validateOptions(). Definition at line 1000 of file RockSwapDir.cc. Definition at line 714 of file RockSwapDir.cc. References assert, debugs, Ipc::StoreMap::entryCount(), freeSlots, map, NULL, Ipc::Mem::PageId::number, Ipc::Mem::PageStack::pop(), Ipc::StoreMap::prepFreeSlice(), Ipc::StoreMap::purgeOne(), Ipc::Mem::PageId::set(), TexcHere, and waitingForPage. Referenced by Fs::Ufs::UFSSwapDir::addDiskRestore(), Fs::Ufs::UFSSwapDir::evictCached(), and Fs::Ufs::UFSSwapDir::finalizeSwapoutSuccess(). Definition at line 188 of file RockSwapDir.cc. Referenced by entryLimitAbsolute(), slotLimitActual(), and validateOptions(). Definition at line 197 of file RockSwapDir.cc. References HeaderSize, map, max(), Store::Disk::maxSize(), min(), Ipc::StoreMap::sliceLimit(), slotLimitAbsolute(), and slotSize. Referenced by entryLimitAbsolute(), entryLimitActual(), Rock::Rebuild::Rebuild(), statfs(), and validSlotId(). Definition at line 52 of file RockSwapDir.h. References freeSlotsPath(), hasReadableEntry(), and inodeMapPath(). Referenced by create(), Fs::Ufs::UFSSwapDir::createDirectory(), Fs::Ufs::UFSSwapDir::doubleCheck(), Store::Disk::maxSize(), Fs::Ufs::UFSSwapDir::openTmpSwapLog(), Fs::Ufs::UFSSwapDir::pathIsDirectory(), Store::Disks::stat(), and Fs::Ufs::UFSSwapDir::writeCleanStart(). Definition at line 1063 of file RockSwapDir.cc. References Config, currentSize(), Math::doublePercent(), Ipc::ReadWriteLockStats::dump(), Ipc::StoreMap::entryCount(), entryLimitActual(), Store::Disk::flags, freeSlots, map, SquidConfig::max_open_disk_fds, Store::Disk::maxSize(), PRIu64, Store::Disk::Flags::read_only, Store::Disk::Flags::selected, Ipc::Mem::PageStack::size(), slotLimitActual(), Ping::stats, store_open_disk_fd, storeAppendPrintf(), and Ipc::StoreMap::updateStats(). Reimplemented in Fs::Ufs::UFSSwapDir, Store::Controller, and Store::Disks. Definition at line 78 of file Storage.h. Referenced by Store::Disks::sync(), and Store::Controller::sync(). Definition at line 1047 of file RockSwapDir.cc. References RemovalPolicy::Add, debugs, HERE(), Store::Disk::repl, and StoreEntry::repl. Referenced by createStoreIO(), and get(). Definition at line 1019 of file RockSwapDir.cc. Definition at line 93 of file RockSwapDir.cc. References assert, DiskFile::canRead(), StoreEntry::hasDisk(), Store::Disk::index, map, Ipc::StoreMap::readableEntry(), StoreEntry::swap_filen, theFile, and updateAnchoredWith(). Definition at line 105 of file RockSwapDir.cc. References Ipc::StoreMapAnchor::basics, Ipc::StoreMapAnchor::Basics::swap_file_sz, and StoreEntry::swap_file_sz. Referenced by anchorToCache(), and updateAnchored(). Definition at line 957 of file RockSwapDir.cc. References Ipc::StoreMap::abortUpdating(), debugs, HeaderUpdater, map, Ipc::StoreMap::openForUpdating(), AsyncJob::Start(), and StoreEntry::swap_filen. Definition at line 548 of file RockSwapDir.cc. References DBG_CRITICAL, debugs, entryLimitAbsolute(), fatal(), max(), Store::Disk::maxObjectSize(), Store::Disk::maxSize(), Store::Disk::path, slotLimitAbsolute(), and slotSize. Definition at line 748 of file RockSwapDir.cc. Definition at line 224 of file Disk.cc. Definition at line 218 of file Disk.cc. Referenced by MmappedFile::write(), IpcIoFile::writeCompleted(), BlockingFile::writeDone(), DiskdFile::writeDone(), and DiskThreadsDiskFile::writeDone(). Definition at line 856 of file RockSwapDir.cc. References assert, CollapsedForwarding::Broadcast(), debugs, DISK_ERROR, DISK_OK, droppedEarlierRequest(), StoreIOState::e, Rock::WriteRequest::eof, RefCount< C >::getRaw(), handleWriteCompletionProblem(), handleWriteCompletionSuccess(), WriteRequest::len, noteFreeMapSlice(), NULL, request(), Rock::WriteRequest::sidNext, Rock::WriteRequest::sio, Rock::IoState::stillWaiting(), StoreIOState::swap_filen, and StoreIOState::touchingStoreEntry(). Definition at line 926 of file RockSwapDir.cc. References StoreIOState::e, Ipc::StoreMap::freeEntry(), map, Store::Root(), Store::Controller::stopSharing(), StoreIOState::swap_filen, and StoreIOState::touchingStoreEntry(). Referenced by entryLimitAbsolute(), and handleWriteCompletionProblem(). Definition at line 135 of file RockSwapDir.h. Definition at line 134 of file RockSwapDir.h. Referenced by createStoreIO(), createUpdateIO(), and openStoreIO(). Definition at line 133 of file RockSwapDir.h. Referenced by storeDirWriteCleanLogs(), UFSCleanLog::write(), Fs::Ufs::UFSSwapDir::writeCleanDone(), and Fs::Ufs::UFSSwapDir::writeCleanStart(). Definition at line 151 of file RockSwapDir.h. Referenced by dumpRateOption(), dumpTimeOption(), init(), parseRateOption(), and parseTimeOption(). Definition at line 136 of file RockSwapDir.h. Referenced by create(), createError(), diskFull(), Rock::Rebuild::failure(), init(), ioCompletedNotification(), parse(), Rock::Rebuild::start(), and ~SwapDir(). Referenced by Store::Disk::canStore(), Store::Disk::optionReadOnlyDump(), Store::Disk::optionReadOnlyParse(), Store::Disk::parseOptions(), Fs::Ufs::UFSSwapDir::statfs(), statfs(), and storeDirSelectSwapDirLeastLoad(). Definition at line 147 of file RockSwapDir.h. Referenced by currentSize(), Rock::Rebuild::freeSlot(), full(), init(), noteFreeMapSlice(), reserveSlotForWriting(), and statfs(). Referenced by Fs::Ufs::UFSSwapDir::addDiskRestore(), Store::Disk::Disk(), Fs::Ufs::UFSSwapDir::evictCached(), Fs::Ufs::UFSSwapDir::finalizeSwapoutSuccess(), Store::Disk::sizeInBlocks(), and Store::Disk::stat(). Definition at line 153 of file RockSwapDir.h. Referenced by create(), createUpdateIO(), slotLimitActual(), and Rock::Rebuild::start(). Referenced by Fs::Ufs::UFSSwapDir::addDiskRestore(), anchorEntry(), Store::Disk::canStore(), Fs::Ufs::UFSSwapDir::closeLog(), Fs::Ufs::UFSSwapDir::closeTmpSwapLog(), createStoreIO(), createUpdateIO(), disconnect(), Store::Disk::diskFull(), evictCached(), Rock::Rebuild::failure(), Rock::Rebuild::freeBadEntry(), Rock::Rebuild::freeSlot(), ioCompletedNotification(), Rock::Rebuild::loadingSteps(), Rock::Rebuild::loadOneSlot(), Fs::Ufs::UFSSwapDir::logFile(), noteFreeMapSlice(), Fs::Ufs::UFSSwapDir::openLog(), openStoreIO(), Fs::Ufs::UFSSwapDir::openTmpSwapLog(), parse(), Fs::Ufs::UFSSwapDir::replacementAdd(), Fs::Ufs::UFSSwapDir::replacementRemove(), Rock::Rebuild::start(), Store::Disk::stat(), storeDirWriteCleanLogs(), Rock::Rebuild::swanSong(), Fs::Ufs::UFSStoreState::UFSStoreState(), updateAnchored(), and Rock::Rebuild::validationSteps(). Definition at line 145 of file RockSwapDir.h. Referenced by canStore(), init(), and ~SwapDir(). Definition at line 137 of file RockSwapDir.h. Referenced by Rock::Rebuild::addSlotToEntry(), anchorToCache(), canStore(), createStoreIO(), currentCount(), disconnect(), diskOffsetLimit(), droppedEarlierRequest(), evictCached(), evictIfFound(), Rock::Rebuild::finalizeOrThrow(), Rock::Rebuild::freeBadEntry(), get(), handleWriteCompletionSuccess(), hasReadableEntry(), init(), ioCompletedNotification(), Rock::Rebuild::mapSlot(), openStoreIO(), reserveSlotForWriting(), Rock::Rebuild::sameEntry(), slotLimitActual(), Rock::Rebuild::startNewEntry(), statfs(), updateAnchored(), updateHeaders(), Rock::Rebuild::useNewSlot(), writeError(), and ~SwapDir(). Referenced by Store::Disk::diskFull(), Store::Disk::maxSize(), and parseSize(). Referenced by create(), Fs::Ufs::UFSSwapDir::createSwapSubDirs(), Fs::Ufs::UFSSwapDir::DirClean(), dump_cachedir(), freeSlotsPath(), Fs::Ufs::UFSSwapDir::fullPath(), inodeMapPath(), Fs::Ufs::UFSSwapDir::logFile(), Fs::Ufs::UFSSwapDir::maintain(), Store::Disk::maxObjectSize(), Store::Disk::optionObjectSizeParse(), parse(), parse_cachedir(), Store::Disk::parseOptions(), parseRateOption(), parseSize(), parseSizeOption(), parseTimeOption(), Store::Disk::stat(), Fs::Ufs::UFSSwapDir::statfs(), Fs::Ufs::UFSSwapDir::swapSubDir(), validateOptions(), Fs::Ufs::UFSSwapDir::verifyCacheDirs(), and Store::Disk::~Disk(). Referenced by Fs::Ufs::UFSSwapDir::dereference(), dereference(), ignoreReferences(), Fs::Ufs::UFSSwapDir::maintain(), parse(), Fs::Ufs::UFSSwapDir::reference(), reference(), Fs::Ufs::UFSSwapDir::replacementAdd(), Fs::Ufs::UFSSwapDir::replacementRemove(), Store::Disk::stat(), trackReferences(), and Fs::Ufs::UFSSwapDir::writeCleanStart(). Definition at line 81 of file RockSwapDir.h. Referenced by createUpdateIO(), currentSize(), dumpSizeOption(), parseSizeOption(), Rock::Rebuild::Rebuild(), slotLimitActual(), and validateOptions(). Definition at line 146 of file RockSwapDir.h. Referenced by anchorToCache(), canStore(), closeCompleted(), createStoreIO(), createUpdateIO(), get(), init(), ioCompletedNotification(), openStoreIO(), and updateAnchored(). Definition at line 148 of file RockSwapDir.h. Referenced by noteFreeMapSlice(), and reserveSlotForWriting().